Technology developed by UC Davis animal scientist James Murray that could significantly reduce human suffering and death from diarrhea has found a home in Brazil. Goats genetically altered to produce milk that prevents diarrhea have been in development in Murray's Davis lab for decades, according to an article in Technology Review. However, sensitivity to the idea of bioengineered animals in the United States has severely limited research funding. Currently the project is supported with a three-year, $400,000 USDA grant to assess the risks of transgenic animals. Feral canola is growing on North Dakota roadsides. Canola that is genetically modified to be resistant to two herbicides is growing along roadsides in North Dakota, according to a New York Times blog post by Andrew Pollack. Even though critics of biotech crops point to the situation as "gene pollution," Pollack said the finding may not be a problem at all. And if it is a problem, he wrote, "It’s because a canola plant growing outside of a canola field – on a road or in a field of wheat, for example – could be considered a weed." 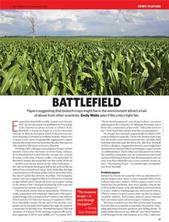 "Battlefield" was published in Nature. One Friday afternoon in 2007, two UC Riverside scientists went out for a beer after work and comiserated over a research report published in the most recent Proceedings of the National Academy of Sciences. "I don't think there's been another case where I've seen him so really ticked off," said insect pathologist Brian Federici of his colleague plant biotechnologist Alan McHughen. Federici said he was also annoyed by the article, which he called "bad science." Capitol Press covered an agritourism seminar held recently in Stockton and developed a detailed article with much information drawn from a presentation by Holly George, UCCE's Sierra and Plumas county livestock and natural resources advisor.